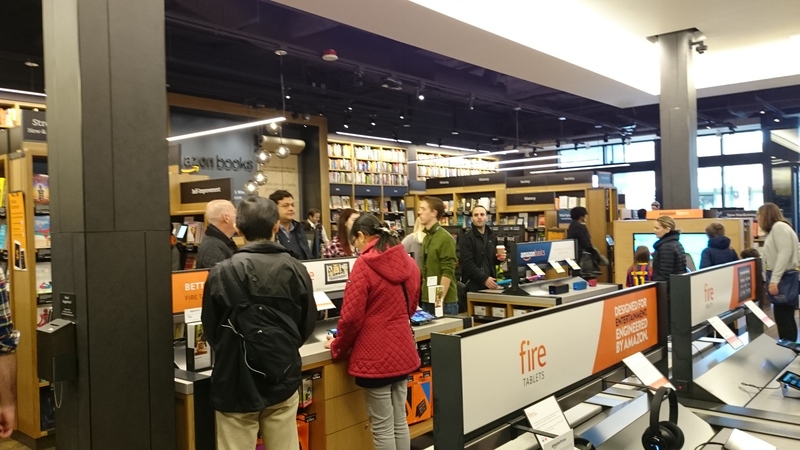 Amazon launched their first bookstore in Seattle this week and Good e-Reader was live on the scene. 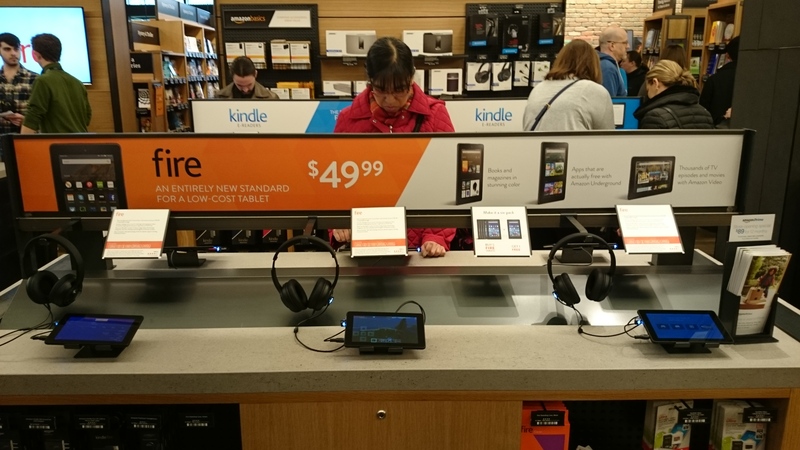 It was our intention to take a look how Amazon has setup the display area for the Kindle e-readers, Fire Tablets and other items such as the Echo and Dash. Many tech stores already sell these items, but this is the first time Amazon has had direct control over the way they were presented. It is important to first note the way the bookstore is actually constructed. The bookshelves are very close to each other and you can tell Amazon deliberately positioned them this way and modeled them after a nightclub. If you have two people in any given aisle, you will always be slightly touching the person next to you. Amazon has devoted the maximum number of square footage to the e-reader display areas of the Kindle. There is a very large area where people will not bump into each other and this is to give people a chance to try the Paperwhite, Voyage, or Basic out and not have to constantly bumping into people. Next to each e-reader is a small card that tells you a little bit about the device, in terms of overall specs. The Paperwhite and Voyage are hyping the built in reading light and high resolution displays, while the Basic appeals to the the casual reader who might never have owned a Kindle before. This picture shows you how much Amazon is trying to really push the very affordable $50 Kindle Fire. They even are really hyping up the six pack, where you can get a discount if you want to take the plunge and buy a Fire for everyone you know. Each Fire has a pair of headphones, so you can play some games or listen to Prime Music or watch some Amazon Instant Videos. Underneath the display area are things like Amazon Gift Cards, USB cables and SD cards. 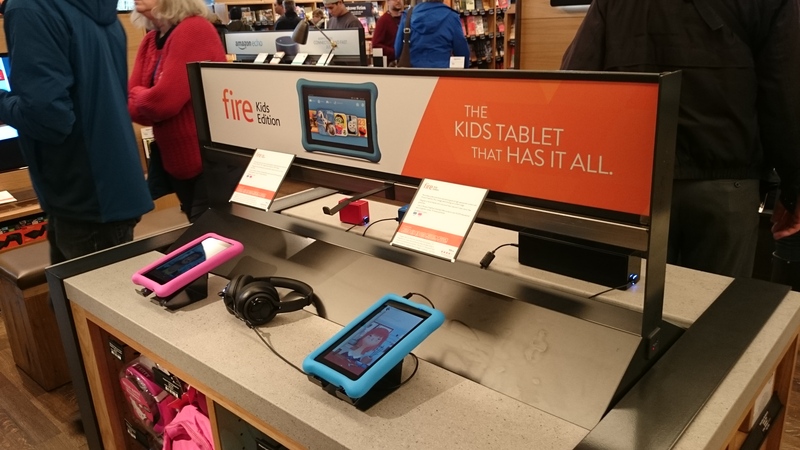 Last year Amazon introduced the Fire for Kids tablet and it had a lot going for it, including its rubberized case, year-long subscription to Amazon’s FreeTime – Amazon’s service that offers a curated and locked-down catalog of games, apps, videos and books – as well as a two-year warranty. There were a range of sizes available such as a six inch for $149 and $189 for the 7-inch version. This year Amazon decided to not make the same tablet in two different screen sizes and is simply offering one seven inch kids tablet. The company has now dropped the price of the hardware to $99.99, which includes the kid-proof case along with the warranty and year of FreeTime Unlimited. Amazon has two demo units where the Freetime interface is loaded, so parents can see the interface is like, but this area is mainly for kids. The bumpers on the tablets have bright and vibrant colors to attract the eye. Underneath the display area are headphones in pink and blue and Hello Kitty accessories. 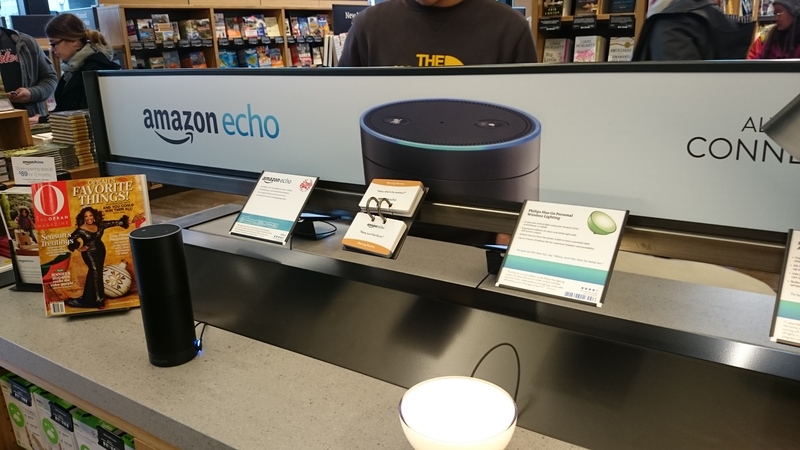 Amazon Echo, also known as Alexa, is a voice command device that is always listening. Its functions include question answering, playing music and controlling smart devices. Amazon is always adding new features to their little pet project. You can now listen to audiobooks from Audible or listen to feature news articles and stories. Amazon is using this area to hype up their compatibility with Philips Hue smart lights and they also sell the lights right underneath the display area. Amazon is using the smallest display area to promote their Audible service, where they have a few demo units loaded up with the audiobook app, so you can get yourself exposed to it, if you never listened to one before. They also have a Kindle Basic available, with a few books that have recently got the movie treatment, such as Andy Weirs The Martian. 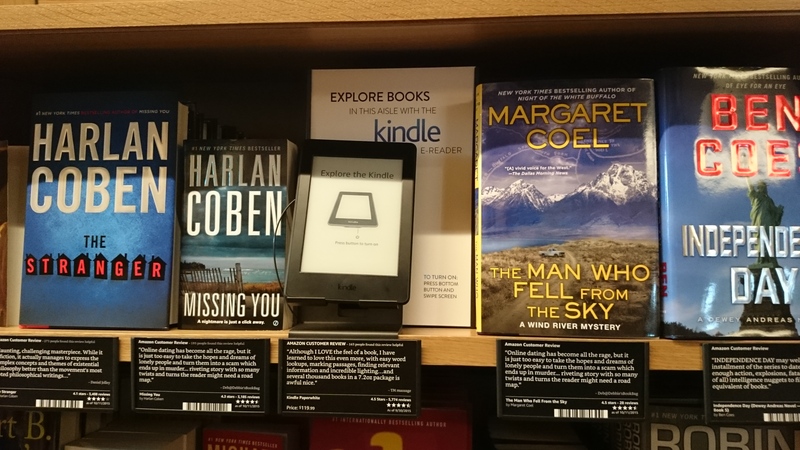 Throughout the bookstore, Amazon has strategically placed a number of Kindle Basic e-readers. I counted around 12 different units sitting on various bookshelves, right next to big name authors. Basically, every single shelf in the entire store, had a Kindle. This is the first time that I have ever seen a bookstore place such a heavy emphasis on e-readers. Barnes and Noble sequesters them to a specific area of the store, normally just on a plain white table. WH Smith, Waterstone’s and other UK bookstores relegate e-readers to one very small area, normally at the very back of the store. 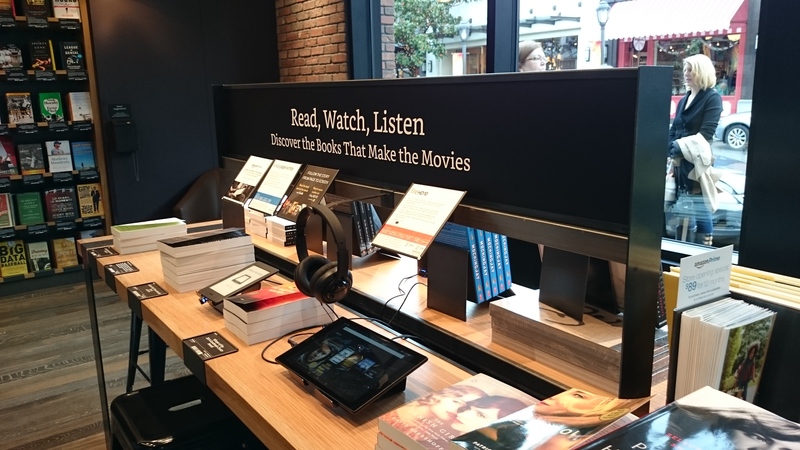 Amazon is a fine example of how you can blend digital readers and print in a conventional bookstore. They have a bigger tech area than any other bookstore in Canada, US and UK. 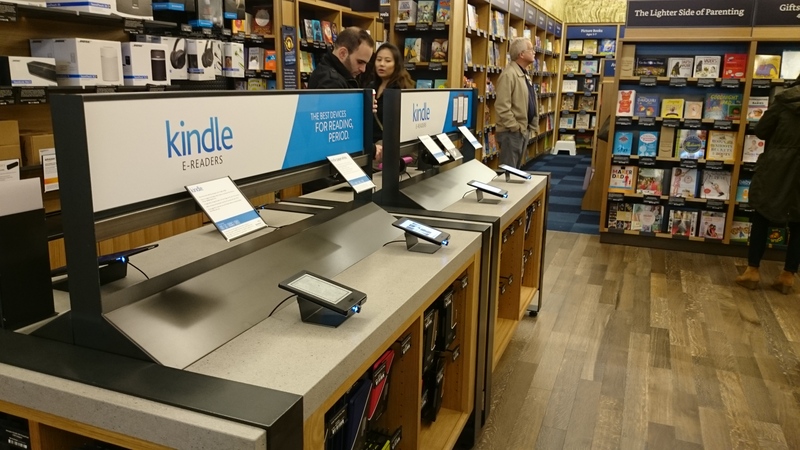 The fact that e-Readers are all over the store tells me that Amazon does not see a distinction between reading print, or digital. In the last picture the Margaret Coel book has the customer review text of the Harlan Coben book to the left of it on its presentation card. The star rating and bar code are different though. Maybe someone picked up the book and just sat it down in the wrong place. No, everything below the line, e.g. book title and author name, is correct – only the review above it is about the Coben book. Curiously the top review for both books at the amazon website is by the same person.